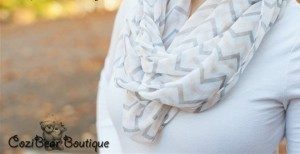 Choose from 12 hot color combinations in this Chevron Infinity Scarf Only $4.99! Perfect for layering with your long sleeved tees on these cool Spring days! Perfect item to snag a few of for gift giving throughout the year!